Springtime just brings a smile to my face; everyone is enjoying the weather outside, colors are bright and happy. It is the perfect excuse to try something new. This year, I am focusing on creating a few new springtime traditions for Ryker! I love making traditions with my family and one you may have seen over on my instagram is our #smithfamilysunday posts. This year Ryker also gets to have fun at Grandma & Grandpa Smiths Easter Egg Hunt and cannot wait to see his reaction! We are also planning on coloring Easter eggs Saturday night so it is probably going to be a hot mess but I wouldn’t have it any other way. I may even get creative and try a new pinterest Easter recipe. I did these Cinna Bunnies before we had Ryker and they turned out pretty cute! It has always been one of my favorite traditions to get a new dress for Easter Sunday. I feel like I am a pretty good mix of girly and tom boy, but Sundays are just one day that I love to get all dolled up. Chicwish has been one of my favorite sites for quite some time and while browsing through I found this dress and instantly knew it would be great for Easter. I contemplated getting it in every color but went with this gorgeous seafoam. I realized I actually don’t own a lot of green so I had to reach outside my comfort zone. Normally I lean towards white or navy but I really love this color and can’t wait to share our family picture Sunday! I got the dress in an xs but since I am petite, it was still pretty loose in the waist. I paired it with my favorite cream and gold belt and loved the gold details so I also went with this clutch for some extra personality. 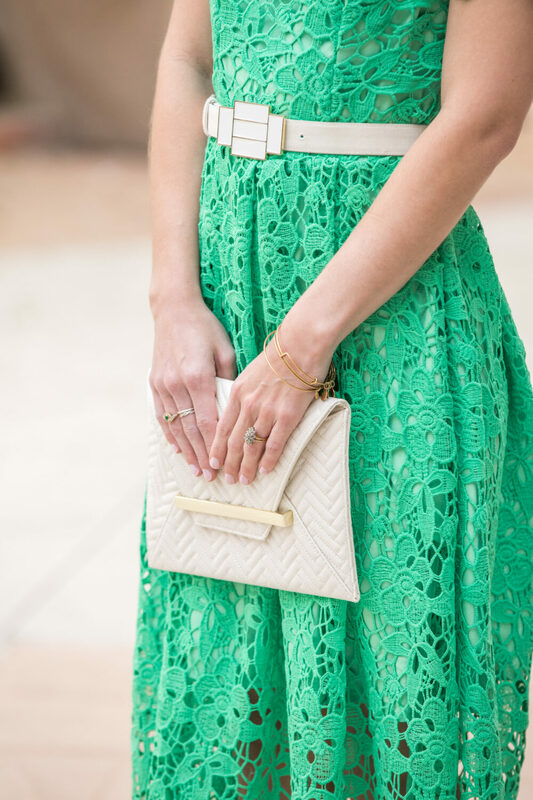 When I wear bold colors, I tend to use neutral accessories to keep the look classic.